Proud Vendor of United States Coast Guard Displays Since 1994, the United States Coast Guard and US Coast Guard Auxiliary has relied on Capital Exhibits for their trade show displays, banner stands, trade show booths, tablecloths, tabletop displays, other custom displays and banner printing. Why? Because when it comes to professional results, Capital Exhibits builds your best image. 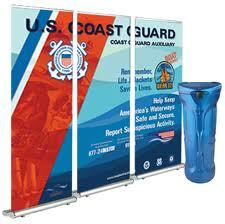 No other company provides consistently superb custom displays and banner printing for better prices, and our company is very proud to be the premier provider of portable displays for the USCG, USCG-AUX, U.S. Dept. of Homeland Security and other governmental agencies. Ask About Our Next Day Banner Stands! Call us today at 866.730.3746 and find out why we are the premier provider of United States Coast Guard displays, trade show booths and other custom displays! Capital Exhibits has all the US Coast Guard Logos in Vector files. Also we have the US Department of Homeland Security Logos, Operation Life Ring, U.S. Coast Guard Seventh District, America’s Volunteer Guardian, Boat Responsibly, Boat, United States Coast Guard. We archive high-resolution logos for various divisions of the U.S. Coast Guard, the US Coast Guard Auxiliary and other governmental agencies. This allows for fast turnaround times and great-looking displays that reflect our pride in what we do. It is an honor to create custom displays with Coast Guard flags and other proud logos of the agencies representing our country, and we never lose sight of the fact that our reputation is on the line with every trade show display we manufacture. If you’d like to learn more about why the USCG, USCG Auxiliary and other government agencies choose Capital Exhibits for all their custom displays, we invite you to call us today at [email protected] Sure, there are plenty of other custom display designers, developers and manufacturers to choose. However, USCG-AUX and the U.S. Dept. of Homeland Security prefer Capital Exhibits because we provide results and not excuses. 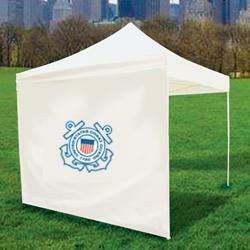 We offer wholesale prices without sacrificing quality or durability. We build their best image!